Photograph taken from the ship “Prinz Adalbert”. Just before midnight on April 14, 1912, the ocean liner Titanic struck an iceberg. Less than three hours later, she lay at the bottom of the Atlantic Ocean, having taken with her more than 1,500 of the roughly 2,200 people on board. The exact size of the iceberg will probably never be known but, according to early newspaper reports the height and length of the iceberg was approximated at 15-30 meters high and 60-120 meters. 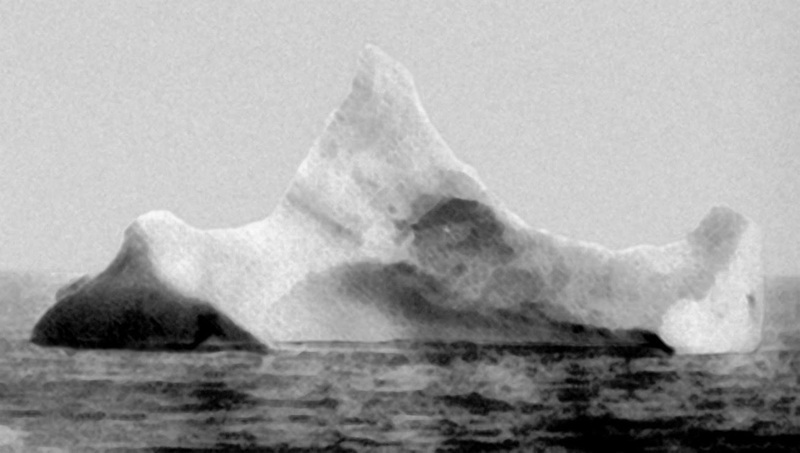 One of the many icebergs suspected of having sank the Titanic, this iceberg was photographed in the morning of April 15, from board of the ship “Prinz Adalbert”. The photograph was taken by the chief steward of the liner, just a few miles south of where the “Titanic” went down. The steward hadn’t yet heard about the Titanic. What caught his attention was the smear of red paint along the base of the berg, indication that it had collided with a ship. (Right) Colorized version of the picture taken from “Prinz Adalbert”, (Left) Photography taken from the ship “Birma. This can hardly have been the iceberg which the Titanic collided with: it is known that the Titanic ripped great chunks out of the iceberg and did not simply leave a few scars of red paint. The real origin of the red color cannot be said. Maybe it was from a ship, maybe it was a colored layer. Icebergs with layers in different colors (mostly brownish) are not scarce. But there is nothing in the Prinz Adalbert iceberg photograph which suggests the impact of violent forces. Another iceberg photographed April 20, from the German steamer “Bremen”. 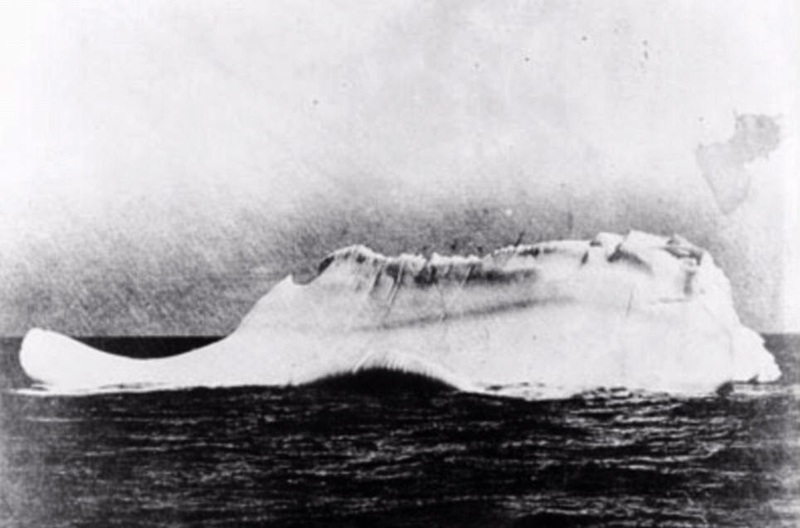 Another iceberg photographed April 20, from the German steamer “Bremen” claimed to be the Titanic iceberg based on the vicinity to the location of the disaster and the description of the iceberg according to eyewitnesses reports of Titanic survivors. This ship sailed past the scene of the accident on its way from Bremerhaven to New York. On 20th April the Bremen sailed into the area of the disaster, the people on board could see wreckage and the bodies of more than a hundred victims floating on the water. An iceberg was sighted “in the vicinity” which fitted precisely the description of the Titanic iceberg. The photo was taken by Stephan Rehorek, a Bohemian traveling the German steamer Bremen. Photography of an iceberg from the cable ship “Minia”. Another iceberg was photographed by he cable ship “Minia”, one of the first ships to reach the area in search for debris and bodies. The crew found debris and bodies floating in the vicinity of the depicted iceberg and the captain assured that this was the only iceberg near the scene of the collision. This photo was taken by Captain De Carteret of the Minia. According to the Minia’s records, it was the only iceberg in the area. He also noticed the red scar along the base – a clear sign it was the culprit for the Titanic’s end. Photography taken from board of the ship “Birma” of the same iceberg as seen by the passengers of the “Carpathia” – the first ship to approach the scene of the disaster and save the surviving passengers of the Titanic. This iceberg has in fact some remarkable similarities to the iceberg as described by survivors of the disaster. The icebergs from the North Atlantic originate mainly from the western coasts of Greenland, where ice streams deliver large quantities of ice in the fjord-systems which leads to the Baffin sea. Still today this region is the most important origin of icebergs on the northern hemisphere, thousands of junks of ice per year drop from the front of the glaciers and if large enough will one or three years later reach the North Atlantic.